(S) Vintage Mens 70s Hawaiian Shirt! Blue w/ Wild & Busy Mismatched Pattens! 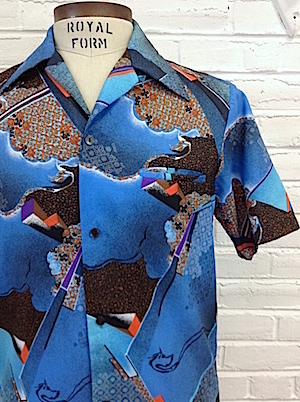 Home > Men's Vintage Shirts > Hawaiian Shirts > (S) Vintage Mens 70s Hawaiian Shirt! Blue w/ Wild & Busy Mismatched Pattens! 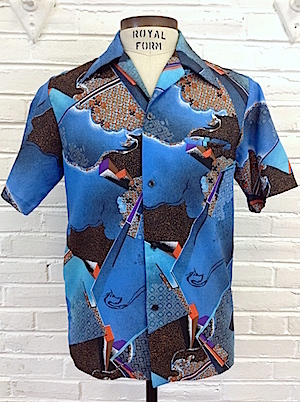 Classic vintage 70s mens Hawaiian shirt! This tropical top comes in various shades of blue, brown, orange, white, purple and black with an array of wild and intricate patterns that channel geometry, nature and decorative tiles! Closes in the front with pearly dark gray buttons. Has an extra wide 70s collar. Shirt has one inner chest pocket and a straight hem. Tagged by Malihini Hawaii. 100% Polyester..